Location: Location to be shared via private emails. 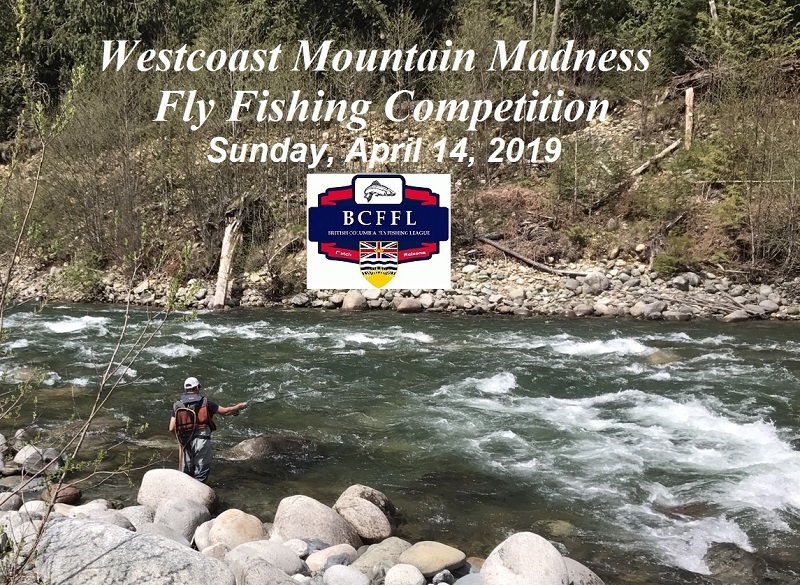 Entry Fees: $15.00 (2019 Fly Fishing Canada Membership Card Holder Discounted Rate: $10.00). Number of Sessions: 2 sessions (3 hours of fishing per session). Eligible fish species: Whitefish, Cutthroat and Rainbow Trout. Scoring system: 1 point per fish. Number of Participants: 8, 12, or 16 competitors (max of 16). Number of Groups: 2 groups (A/B). Competitors per Group: Each groups will consist of 4, 6, or 8 anglers (dependant upon the number of participants). The Draw: Groups and team members will be randomly drawn at the Designated Meeting area. * Competitors will fish as a teams, which will provide a great team-building exercise and learning opportunity for the rookies! • Registration is accepted on a first come, first served basis. Early registrations will not be accepted. • Competitors that are submitting registration must be 100% committed to attending this event! • Registration fees are due in full and must be received by Friday, March 8, 2019 in order to officially complete the registration process and secure your spot for this competition. No Fishing Period: The competition beats on this venue are closed to fishing for all competitors and their agents as of 6:00am on April 1, 2019. Competitors are free to fish other sections of the river, but cannot fish the competition beats or have their associates or friends fish them for their gain. Please note that all competitors are required to wear CSA Approved PFDs, wading belts, and eye protection at all times!!! Special Wading Restrictions: Competitors are not allowed to wade in water that is greater than 2 feet in depth. Medals will be awarded to the top 3 individuals. Individual results will be included on the BCCFFL Leader Board (maximum 600 point scale event). Fly Fishing Canada= Level 5 Competition. 550 Point Maximum Value (based on average NRPs of the top 5 ranked competitors). Number of sessions: 2 (AM Session and PM Session). Length of each session: 3 hours (90 minutes fishing per beat) (dependant on the number of competitors). Number of River Beats: 4 beats. Beat Divisions: Beats are divided into 4 sections (dependant on the number of competitors). Competitors rotate to the section downstream of their location within the beat. Competitors in the bottom section rotates to the top section of the beat. 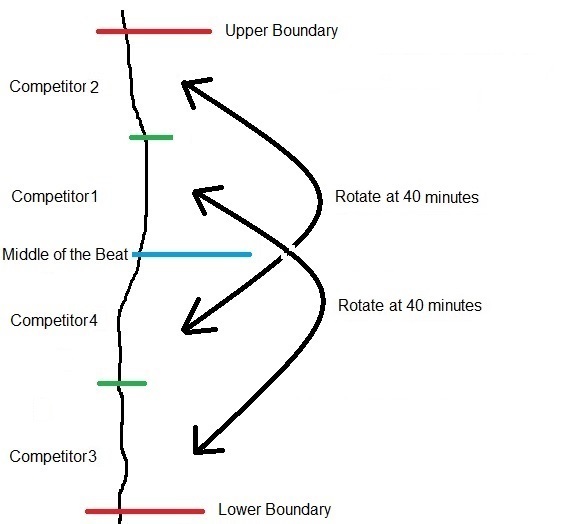 Competitor positioning within beats: 3 or 4 or competitors per beat (dependant on the number of competitors). Competitor Rotation: 30 minute rotations within each third of each beat (dependant on the number of competitors). Beat Relocations: 30 minute time allowance to relocate to the next beat. Lunch Break: 60 minutes time allowance for lunch break and relocating between sessions. Please contact Todd Oishi at: toishis@gmail.com in order to register for this competition. Total number of sessions: 2 sessions (8:30am – 11:30am and 1:00pm – 4:00pm). Total number of beats: 4 beats (depending on the number of competitors). Each session consists of 160 minutes of fishing. Number of sessions: 2 sessions (AM Session and PM Session). Length of each session: 160 minutes. Number of beats fished per session: 2 beats. Beat divisions: Beats are divided into 4 sections. 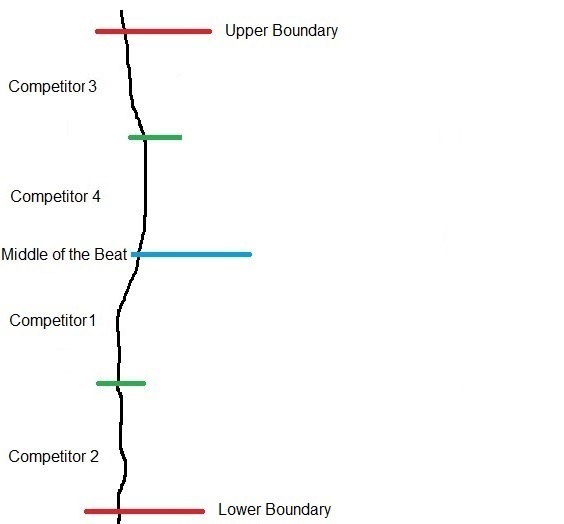 Competitor positioning within beats: Positioning to be "drawn by straws". Fishing time per section: 20 minutes. Beat Relocations: 20 minute time allowance to relocate to the next beat and discuss tactics. Lunch Break: 90 minutes time allowance for lunch break (eat while driving) and relocating to the other side of the river between sessions. 7:00am: Competitors' Meeting at Designated Parking Location (information will be sent to all registered competitors via email). 7:10am: Carpooling, shuttling, and departure for the river beats. Please note that there the beats are divided into 4 quadrants. There will be 1 competitors fishing within each quadrant (4 competitors per beat). The competitors fishing within the 2 quadrants within each half of the beat will swap quadrants after 20 minutes fishing time. After 40 minutes fishing time, all 4 competitors will move to the opposite half of their beat and resume fishing. The competitors will swap quadrants within their half of the beat after 20 minutes fishing time. Competitors will draw straws (4 different lengths) upon their arrival at each beat in order to determine the starting positions for each competitor. 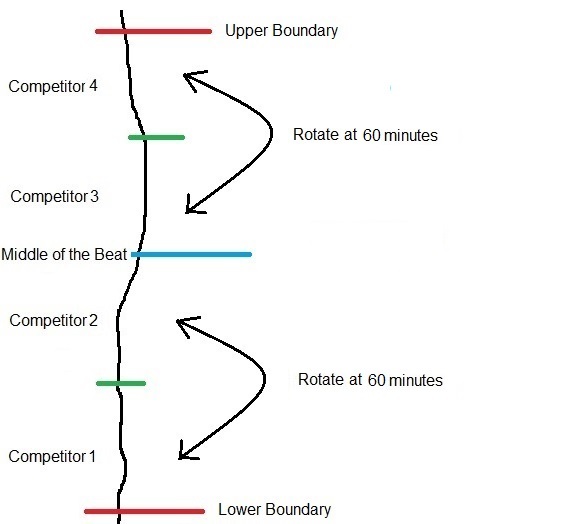 This new rotation/format will provide more equal opportunities and create a more fair rotation for all competitors, as no one will have to walk a distance greater than 2 quadrants during the rotations within each beat. It will also reduce the amount of time and energy that's required to rotate within the beats and ensure that competitors are able to monitor each other at all times. Gents, there are a few anglers who have still not paid their registration fee for the event (if you are not listed as paid, but you are certain you paid, please contact me in case I missed it). We will have maps going out shortly for the event. We anticipate a lot of fluctuating water levels over the next 2 weeks depending on the temperatures and the rainfall. The rivers are still pretty low, though have come up a bit. They look gorgeous! I suggest that anyone that isn't paid shortly that we start them with minus-5 fish on the scorecard at the beginning of the day... lol. As hard as fishing has been, that would sure make for a kick in the teeth! Due to a cancellation for health reasons, we are looking for an angler to fill the vacant spot on the roster for this competition. Please post on this thread or email me at: toishis@gmail.com if you'd like to participate and are able to help us out. Three emails just went out with all the details... please check you email! Due to a cancellation (for health reasons) we are desperately looking for an angler to fill the vacant spot on the roster for this competition. No previous competition experience necessary, as you will be paired with 3 other competitors that will help and mentor you through the process. Thanks to Bobby Danilkiewicz, we now have our 16th and final competitor for this event! The new competitor is Eric Bell. Please take the time to give him some tips and even flies to help him have a great experience and time spent with our group. I need to know which of you will be driving for this competition, so we can ensure that we have enough vehicles in each group. A short update will go out Saturday afternoon once the beats are marked. Looks like conditions will be good and hopefully the weather will be half decent!